KIEV, Ukraine -- Two years ago, Hryhoriy, a retired police officer from a provincial Ukrainian town, nearly died of AIDS. 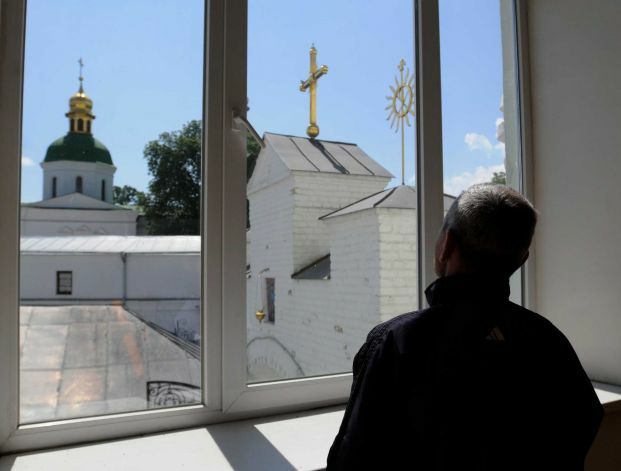 Hryhoriy, a retired police officer suffering from AIDS looks at an Orthodox Cathedral near his AIDS clinic in Kiev, Ukraine, Friday, June 29, 2012. Advocacy groups are accusing the government of embezzling millions of dollars in corrupt drug tenders and thus depriving patients of vital treatment. They also say that with AIDS deaths up 20 percent since last year as a result of non-treatment, Ukraine can hardly afford to spend billions of dollars on hosting the Euro 2012 football championships ending Sunday. Yet the ghostly, emaciated father of two considers himself lucky because he eventually got treated at a Kiev clinic and is now slowly recovering. Unlike the 53-year-old Hryhoriy, tens of thousands of fellow Ukrainians infected with HIV are not getting any treatment at all because the state says it doesn't have enough money. A day before Elton John and Queen sing in the Ukrainian capital in a charity concert to raise AIDS awareness, advocacy groups are accusing the government of embezzling millions of dollars in corrupt drug tenders and thus depriving patients of vital treatment. They also say that with AIDS deaths up 20 percent since last year as a result of non-treatment, Ukraine can hardly afford to spend billions of dollars on hosting the Euro 2012 football championships ending Sunday. Ukraine has one of Europe's biggest AIDS epidemics with about 1 percent of the adult population infected with HIV, the virus the causes AIDS, according to the World Health Organization. Ukraine is a leading recipient of aid from The Global Fund to Fight AIDS, Tuberculosis and Malaria, which covers about 10 percent of the country's needs, the rest coming from state coffers. Of the estimated 450,000 Ukrainians who are HIV-positive, 70,000 require urgent treatment today. But only 28,000 are receiving it, leaving over 40,000 of patients without anti-retroviral therapy, which could greatly prolong their lives, according to WHO. "It's alarming. These figures definitely show that the country, the government and international organizations should pay much more attention," said Dr. Igor Pokanevych, head of the WHO Country Office in Ukraine. "More resources should be allocated to fight against AIDS in this country." But advocacy groups charge that the government in fact has the necessary funds to treat all of its AIDS patients. They accuse Health Ministry officials of embezzling money that should be used to treat patients by buying AIDS drugs at hugely inflated prices and then pocketing kickbacks. Pokanevych said that a complicated system of tenders for drug procurement allows the government to purchase drugs up to 5 times the market price. Had the drugs been purchased at a fair price, the government would have had the money to treat all those 40,000 patients who are left untreated today, Pokanevych said. Dmytro Sherembey, an activist with the All-Ukrainian Network of People Living with HIV, a leading AIDS advocacy group in Ukraine, said his group recently purchased a package of an anti-retroviral drugs for 3.5 hryvna ($0.43) per tablet, while the government bought 14 million hryvna ($1.8 million or euro 1.4 million) worth of the same drug for 7.80 hryvna ($0.97) per tablet. He accused the Health Ministry of purchasing AIDS drugs from friendly middlemen companies and then pocketing millions of dollars in kickbacks. "If a patient is not receiving vital drugs, in the end he dies," Sherembey said. "Corruption is a bulldozer that is destroying Ukrainians." Health Ministry officials were not available for comment due to public holidays. Previously, the Health Ministry has denied accusations of corruption and insisted that major drug buyers like the Global fund, which paid for Sherembey's drug purchase, had better deals because they bought more. Sherembey, who is now leading a campaign to get the government to earmark 400 million hryvna ($50 million or euro 40 million) for AIDS treatment and prevention for next year, says Ukraine should not have spent $6.4 billion on hosting Euro 2012, when tens of thousands of AIDS patients are at risk of dying without treatment. "I also love football, I love many things, but I love life more," Sherembey said. The construction of the Olympic stadium in Kiev, which will proudly host Sunday's final, cost the government $550 million — enough to treat all of the country's patients currently in need of therapy for many years to come, according to Sherembey. In 2009, after months of feeling exhausted, running a fever and losing weight, he was diagnosed with AIDS, which he believes he contracted while donating blood or at a dentist's office. He declined to give his last name, out of fear of being stigmatized by society, saying none of his friends or family except for his wife knows his condition. Hryhoriy spent a year being bounced from one hospital to another where doctors were poorly trained and lacked the necessary drugs; he finally ended up at the Hromashevsky Institute for Epidemiological and Infectious disease in Kiev, one of the country's top AIDS hospitals, where he was finally put on anti-retroviral therapy. "I was almost gone, I was already ready to meet the angels so to speak," Hryhoriy, clad in a red T-shirt and blue sweat pants, said at the clinic. Since his disease started, Hryhoriy has had to sell his car and the auto repair shop that he started after retiring from the police. He is now surviving on what his wife earns by selling shoes at a local outdoor market. He spends his entire monthly pension of 1050 hryvna ($130 or euro105) on medications unrelated to AIDS. "The government should pay the most attention to people like us," Hryhoriy said bitterly. "Nobody is immune to this, it could happen to them (government officials) as well." But Lopatina's heart aches when she sees other frail patients who had not been put on anti-retroviral therapy soon enough, causing the disease to advance and leaving them so ill that they can no longer lead a normal life. "I feel depressed, I am in despair — why does it have to be this way, why didn't they start treatment earlier? It's a tragedy," Lopatina said. "I enter the hospital ward and I see four young men with beautiful hands, legs, bodies, who could be living in peace, working, getting married, but instead they lie here sick and miserable."